Photo: Colonel Roger Brown House, ca. 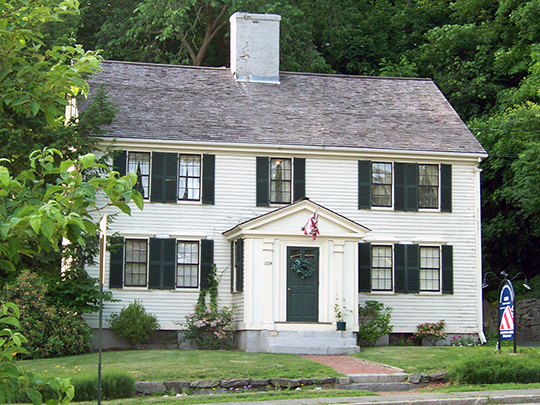 1775, 1694 Main Street, Concord, Middlesex County, MA. Listed on the National Register of Historic Places in 1983. Photographed by User:Esc81 (own work), 2009, [cc-by-1.0 (creativecommons.org/publicdomain/zero/1.0/deed.en)], via Wikimedia Commons, accessed February, 2014. Middlesex County was first organized in 1643. Middlesex County government was abolished in 1997. It remains as a political/geographic region. County courts, jails and other former functions are now carried on by employees of the State of Massachusetts. Historically, functions of the institutions relating to the county seat were shared between Cambridge and Lowell.